"A shoot will come up from the stump of Jesse; from his roots a Branch will bear fruit. The Spirit of the Lord will rest on him— the Spirit of wisdom and of understanding, the Spirit of counsel and of might, the Spirit of the knowledge and fear of the Lord— and he will delight in the fear of the Lord. He will not judge by what he sees with his eyes, or decide by what he hears with his ears; but with righteousness he will judge the needy, with justice he will give decisions for the poor of the earth. He will strike the earth with the rod of his mouth; with the breath of his lips he will slay the wicked. Righteousness will be his belt and faithfulness the sash around his waist." The stump of Jesse refers to the Davidic line of kings beginning with David the son of Jesse. This is a reference to the royal family tree. The problem is the family tree is referred to as a royal stump. This indicates that Isaiah saw the day coming when the royal dynasty of David would be cut down and rejected by the Lord. These kings had rejected the Lord so long that the Lord cuts their tree down. This will happen in King Zedekiah’s day and will be addressed by Jeremiah. Yet, from the root of the promise to David concerning his royal dynasty a branch will grow and bear fruit. The Lord had promised David that one of his own sons would sit on David’s throne and rule forever. This Branch that grows directly from the root of the promise will be the Messiah. Jesus' lineage that connects him directly to David is recorded in Luke 3:23-37, but not to the branches of the family tree that run through Ahaz, Mannasseh, Zedekiah and others. Jeremiah 22:28-30 records the removal of the wicked branch of Davidic kings from God’s promise. Matteh (Hb) - staff (Eng) - The Hebrew word matteh means “staff,” “rod,” “shaft,” “branch,” and “tribe.” The matteh was used by shepherds, but the matteh was also a sign of authority. I will respond to the Lord's guidance and his rebukes. I will not despise the warnings and corrections of the Lord. 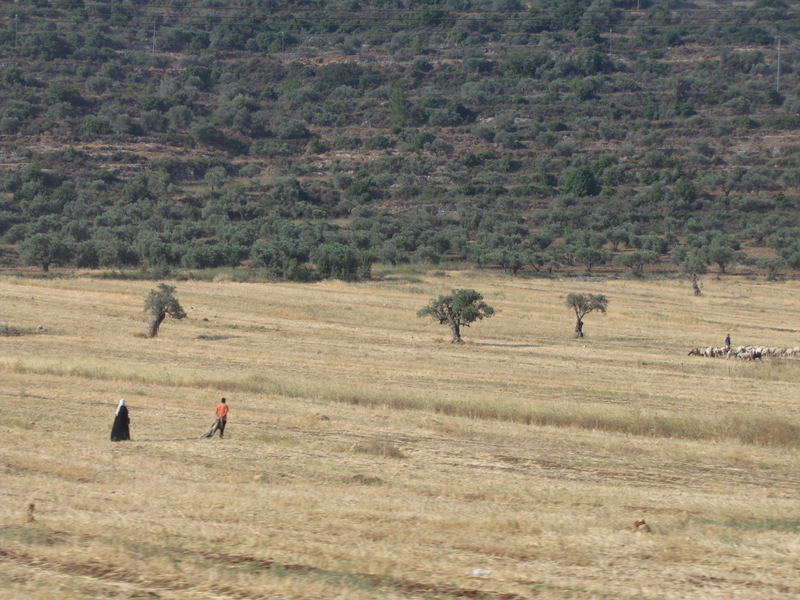 A field in Samaria in June. 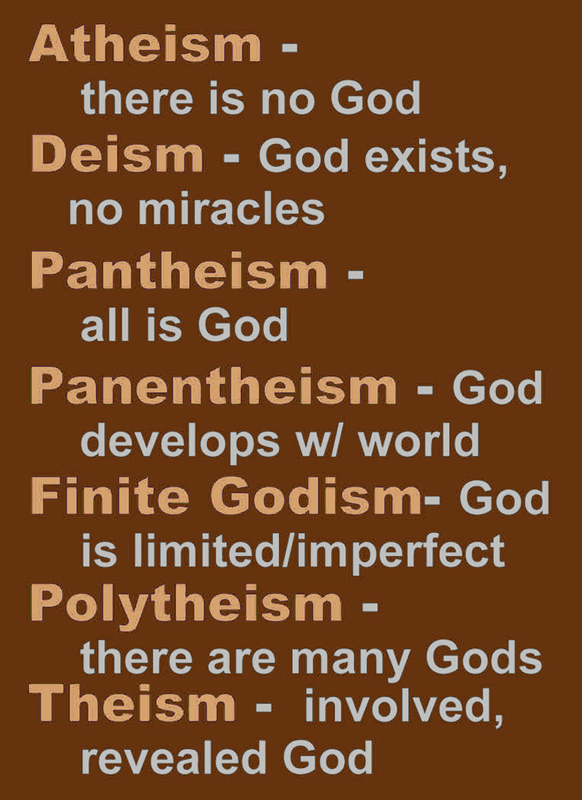 Diagram listing the worldviews of God. Jesus is indeed the Son of God and savior of mankind. In his ministries before God Jesus also serves as a prophet to his generation, a priest who represents men to God and God to man, and a man who will rule the entire world as king. 1. Prophet – Moses said another prophet like him was coming (Deut.18:15). According to Acts 3:22-24, Jesus was that prophet. The crowds received Jesus as a prophet (Matt. 21:11, 46), and Jesus’ claimed to be a prophet (Luke 4:24). 2. Priest – The priests of the Old Testament came from the line of Aaron of the tribe of Levi. Jesus was from the tribe of Judah, yet the New Testament makes it clear that Jesus is a priest like Melchizedek who was not even Jewish. Melchizedek was a priest because he had been chosen by God. The book of Hebrews explains the priesthood of Jesus to the Jewish people. The priests of Aaron served on earth in a man-made temple that was a shadow of heaven. Jesus is a priest who can enter the true heavenly temple and actually remove sin from man in the presence of God. 3. King – Jesus is seated at God’s right hand ruling all creation from heaven now, but we are awaiting his return when he will be King of the whole earth (Zechariah 14:9). "Seldom set foot in your neighbor's house - too much of you, and he will hate you." “Praise be to you, Lord, the God of our father Israel, from everlasting to everlasting. I will leave you in the desert, you and all the fish of your streams. You will fall on the open field and not be gathered or picked up. I will give you as food to the beasts of the earth and the birds of the sky. “Virgin Daughter Zion despises and mocks you. Daughter Jerusalem tosses her head as you flee. Who is it you have ridiculed and blasphemed? Against whom have you raised your voice and lifted your eyes in pride? Against the Holy One of Israel! By your messengers you have ridiculed the Lord. And you have said, ‘With my many chariots I have ascended the heights of the mountains, the utmost heights of Lebanon. I have cut down its tallest cedars, the choicest of its junipers. I have reached its remotest heights, the finest of its forests. “Have you not heard? Long ago I ordained it. In days of old I planned it; now I have brought it to pass, that you have turned fortified cities into piles of stone. Their people, drained of power, are dismayed and put to shame. They are like plants in the field, like tender green shoots, like grass sprouting on the roof, scorched[d] before it grows up. “But I know where you are and when you come and go and how you rage against me. Because you rage against me and because your insolence has reached my ears, I will put my hook in your nose and my bit in your mouth, and I will make you return by the way you came. “This year you will eat what grows by itself, and the second year what springs from that. But in the third year sow and reap, plant vineyards and eat their fruit. Once more a remnant of the kingdom of Judah will take root below and bear fruit above. For out of Jerusalem will come a remnant, and out of Mount Zion a band of survivors. The zeal of the Lord Almighty will accomplish this. By the way that he came he will return; he will not enter this city,” declares the Lord. I said, “I will not again see the Lord himself in the land of the living; no longer will I look on my fellow man, or be with those who now dwell in this world. Like a shepherd’s tent my house has been pulled down and taken from me. Like a weaver I have rolled up my life, and he has cut me off from the loom; day and night you made an end of me. But what can I say? He has spoken to me, and he himself has done this. I will walk humbly all my years because of this anguish of my soul. Lord, by such things people live; and my spirit finds life in them too. You restored me to health and let me live. The Lord will save me, and we will sing with stringed instruments all the days of our lives in the temple of the Lord.